This blog post is a continuation of Insulated Earthbag Vaults and Insulated Earthbag Vaults for Rainy Climates. The Mindfulness Project in Thailand envisions using this design as a part of each housing cluster in their sustainable community. The vaults will likely include photovoltaics, a mechanical room for batteries and electronics, a small shop area with tools for minor maintenance jobs like fixing a bicycle or sharpening tools, and roofwater collection, storage and water pump. Consolidating the mechanical systems is expected to reduce over all costs for homeowners and simplify home construction. It would also eliminate unsightly solar panels in every yard and/or mounting panels on domes and curved roofs. A second similar vault (with smaller windows higher in the wall) will probably be built for toilets, showers, solar hot water and laundry machines, as explained in the previous blog post about Cut Housing Costs with Communal Structures. This is a great idea to have one building specifically for solar power. I’m reading a great low-tech book on using solar heat called “Sunshine to Dollars” by Stephen E. Harris. 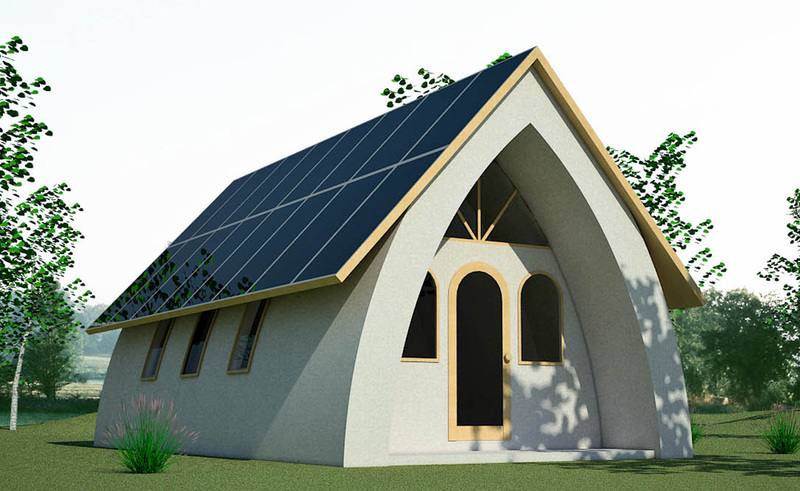 This is really very great idea for a solar power specifically building. It shows your creativity and talent And also shows how to use solar window heaters and solar water heaters. This is really very nice and informative post thanks for sharing.